^ Pope, Sir Joseph (1930) Memoirs of The Right Honourable John Alexander Macdonald. Toronto: ON: The Musson Book Company Ltd., p.3. Pope relates that Hugh Macdonald recorded the time of Sir John's birth as 4:15, January 11, 1815. ^ Waite, P.B. (1976) John A. Macdonald. Don Mills: ON: Fitzhenry and Whiteside Limited, p.7. ^ Phenix, Patricia. (2007) Private Demons: The Tragic Personal Life of John A. Macdonald. Toronto: McClelland & Stewart Ltd. p.6. ^ Swainson, Donald. 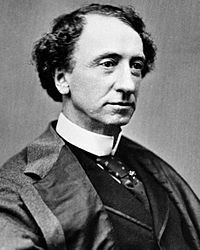 (1989) Sir John A. Macdonald: The Man and the Politician. Kingston, ON: Quarry Press, p.17.